Recieve software tool rapidly and easy. Our library is happy to demonstrate a big assortment of the splendid free programs, utilities, and systems. Here you may obtain trial releases of favorite commercial program solutions, and get the best freeware for your laptop or cellular appliance,gadget. Explore an ultimate group of special new solutions on SoftEmpire directory! Download demo versions and obtain fresh apps on the laptop or mobile device. Have a look on the actual versions and updates of common tool, recent programs, and computer programs! Get now! Select longest lines of identical balls, to be replaced by the incoming balls. Our logical funny games are made to increases the player's intelligence's "muscles". The player trains his brain and has fun too. Einstein's intelligence is not impossible to achieve! The player can have pleasure and train his intelligence in the same time. Pick-a-line is fun and relaxing for everybody. 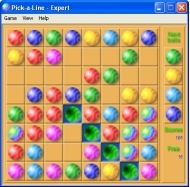 Pick-a-line belongs to the Tetris and Lines games family, but it is completely different. The player can control his destiny in a very clear manner and this make the game interesting for everybody. The object of Pickaline is to select balls of the same color, aligned in a row. The balls must be aligned vertically, horizontally or diagonally. When you pick a line, the balls are replaced by the incoming balls. You can use this to create the lines. The game ends when there is no place for the incoming balls. The incoming balls are in number of 3 for the beginners, 3-4 for the intermediates and 4 for the experts. It's a puzzle game with old water pipe puzzle concept. Your aim is to connect all tubing before the water starts flowing. You may turn tubes clockwise or counter-clockwise to connect them.